As the beginning of the entire workflow, sample collection and preservation is one of the most critical steps for achieving high quality, reproducible results. Yet, sample collection can vary greatly between labs. When a sample is stored or transported at ambient temperature, without a protective mechanism in place (e.g. preservation reagents or effective cold chain), microbes have markedly varied growth and survival rates. This can lead to drastically altered community profiles. Nucleic acid profiles can rapidly change due to degradation or transcription in response to environmental changes. To achieve an accurate representation of the original sample, collection and storage methods need to prevent the alteration of the nucleic acid profile to avoid inaccuracies and biases. While freezing samples at -80°C on site is the most ideal solution, access to freezers is inconvenient or unfeasible in many situations, and transporting samples that require refrigeration or freezing is costly. Some preservation reagents also require reagent removal that can introduce bias by inadvertently causing uneven partitioning of the sample. When and how a sample is collected can also affect observed microbial profiles and should be carefully considered when designing a study. Zymo’s Research DNA/RNA ShieldTM was designed for microbiomic applications and satisfies all of the requirements for accurate community profiling, including preservation of nucleic acids at ambient temperature, inactivating organisms, and enabling high-throughput streamlined purification. The quality of the collection and storage methods can greatly influence the growth and decay of certain microbes, leading to composition shifts after the time of collection. Sample collection and storage can vary greatly between labs - from the handling of samples collected in the field, to the accessibility of storing samples in -80°C freezers. When stored at ambient temperatures, bacterial species have markedly varied growth and survival rates. Nucleic acids can also degrade during this step. Lysis of fragile cells during freeze thaw may also lead to degradation of nucleic acids that leak out during the thawing step, which leads to misrepresentation of the community profile at the time of collection. 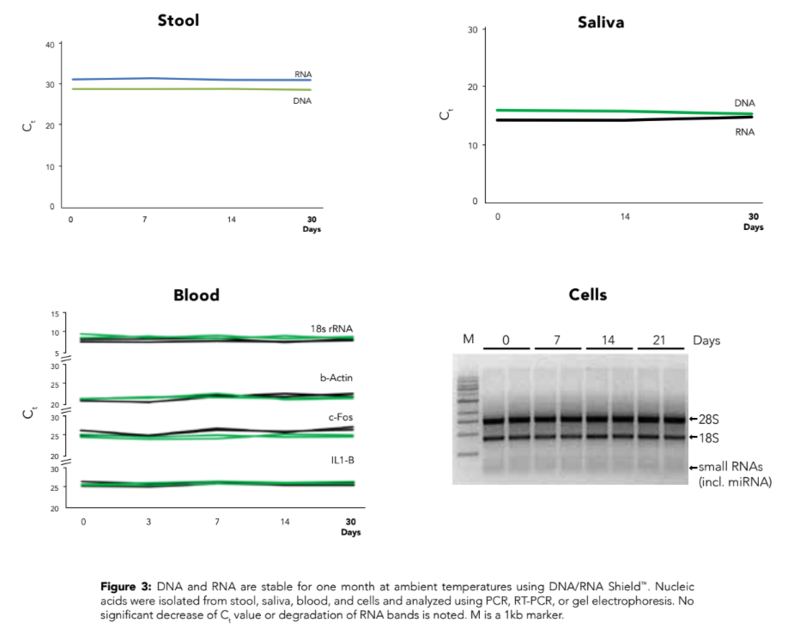 To demonstrate, stool samples suspended in DNA/RNA ShieldTM (R1100-50) and stored at room temperature were compared to stool without preservative for one month (Figure 1). They were sampled at the indicated time points and processed with the ZymoBIOMICS® DNA Miniprep Kit (D4300). The extracted DNA was then subjected to microbial composition profiling via 16S rRNA gene targeted sequencing. Samples stored with DNA/RNA ShieldTM had a constant microbial composition while the samples stored without shifted dramatically. Transporting and mailing samples can often be challenging or not possible, especially when crossing borders. 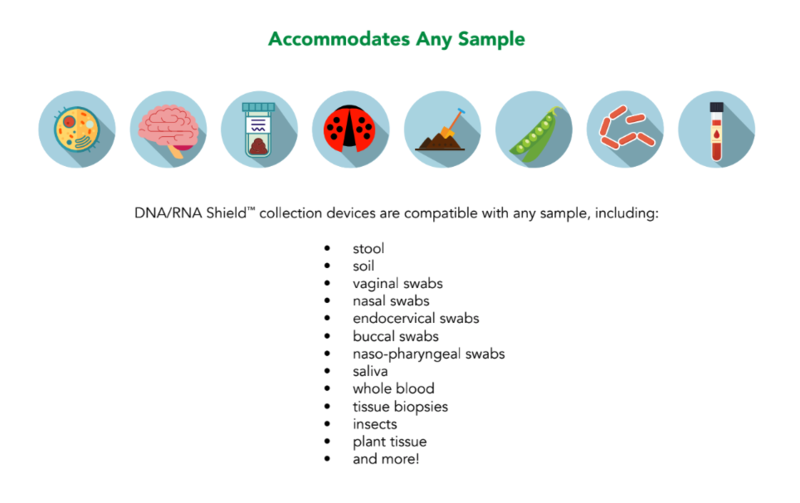 DNA/RNA Shield’sTM ability to inactivate organisms (bacteria, fungi, virus, etc.) including pathogens contained in a sample eliminates safety concerns during transportation (e.g. border crossing) and sample processing (e.g. accidental leakage or spills in DNA extraction). DNA/RNA ShieldTM has been shown to inactivate pathogens (Figure 2) such as Influenza, Ebola, HIV-1, M. tuberculosis, E. coli, and C. neoformans. this time frame (Figure 3). Preprocessing, such as reagent removal, complicates high throughput automation and introduces potential biases associated with phase separations. Phase separation (e.g. precipitation) has been shown to bias downstream analyses as not all nucleic acids fully separate during phase separation. Small nucleic acids (e.g. miRNA) are particularly vulnerable to such biases and/or complete signal loss, because of their aberrant behavior when compared to larger nucleic acids. Samples in DNA/RNA ShieldTM can be immediately used in all ZymoBIOMICS® isolation kits and are universally compatible with all available commercial isolation products. This greatly reduces the amount of handling steps and processing time, allowing for a simplified, streamlined workflow. Quartzy is the world’s No. 1 lab management platform. We help scientists easily organize orders, manage inventory, and save money. We’re free and always will be. Visit Quartzy.com or reach out at info@quartzy.com. 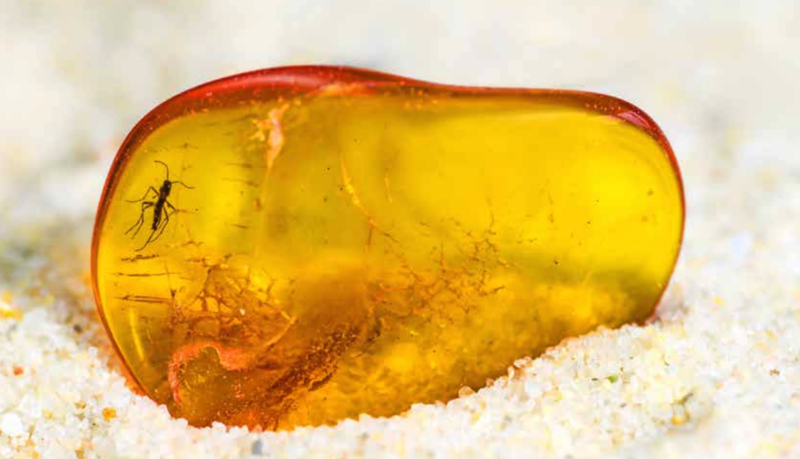 Zymo Research products are all available for purchase in the Quartzy Shop.